Maple butcher block countertops are wood worktops manufactured from sugar maple, a tight grained hardwood that is very resilient to denting and scratching. Maple is one of the best wood for butcher block because it is also less absorbent than any other hardwood, making the countertop more resilient to water damage. They look warm and give a certain rustic appeal to any kitchen, and it’s easy to make maple butchers block countertops look expensive even if they are actually pretty affordable. Maple butcher blocks are also the environmentally sound choice: they come from wood that is grow for purpose at sustainably managed forests, can be made from savaged or reclaimed wood and are naturally biodegradable. Maintenance: You should be sanding and oiling them every couple of years to protect the wood, with bi-yearly routine oiling. How Do Maple Butcher Block Countertops Look Like? Keep in mind that you can also stain your maple wood worktops and seal them to change the color slightly. For example, if you want a darker or warmer result. Over time, a darker patina will develop that will make the wood look warmer. This is a highly desirable way of ageing, and will make your worktops look even better after a few years than when they were installed. With proper care, maple butcher blocks can last for decades. But you need to be careful about water and heat, particularly around the kitchen sink or when using hot pots and pans. If you don’t dry the damp areas near the sink the wood can become discolored, though maple is less porous and generally more water resistant than your average wood butcher’s block. There are many variations in price for this kind of countertops, and you will find that DIY options with ready-cut maple worktops are both cost effective and stunning. Depending on your physical location you can find more or less competitive prices, and don’t forget checking online for the ultimate in bargain maple wood countertops. A maple butcher’s block countertop will usually be between 1.5 and 2.5 inches thick, but a dedicate free-standing one can be as much as 10 inches thick. You can also buy maple butcher block countertops off the shelf, if you are fine with using pre-cut sizes, which allow for a 2-foot wide countertop with a 1 1/8inch overhang, suitable for most kitchen projects. They are usually planks about 2 inches thick, and 6 to 8 feet in length, or even smaller 2×2 feet cutting boards available in many home improvement and DIY stores. You will need to find a backsplash to match but you can buy a 4inch maple backsplash for about $12.50 dollars, which makes it pretty affordable and gives the kitchen a lovely cohesive and professional feet. It is usually best to buy both the worktops and the backsplashes from the same supplier, as the wood grain and color will be most similar. Can You Install Maple Butcher Block Countertops Yourself? 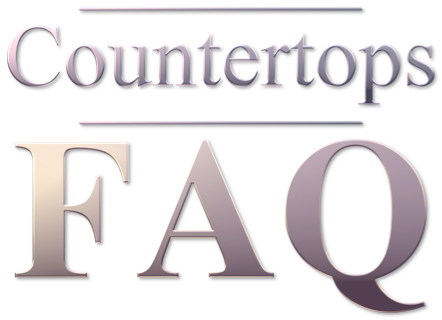 The short answer is yes, you can install your new countertops yourself. Unlike stone countertops, wood is light enough and can be cut with tools that you can find on a regular home improvement store. It is not a quick and easy project, unless you do it for a living. But it is an easy to moderate job for somebody with a bit of experience doing jobs around the house. Always easier if you have somebody to help! Start with measuring the area. Do it twice, and leave a bit extra for waste and repairs. Don’t forget that you don’t want your countertop to lay flush against the edge of the worktops; you will want to leave a bit extra overhand for a more pleasing result. Make a template for the placement of the sink and faucets. You can use a saw to cut wood countertops, and you can bevel the edges with a router. They are just wood! Sand the counter so it’s smooth, using higher level grit sandpapers to achieve a flawless finish. Use wood putty to fill in any gaps or dents that are too deep to sand. Wipe the wood free of sawdust with a vacuum brush or a soft cloth. Apply the finish, usually a mineral oil or food-safe oil so you can prepare food. If you prepare food on a maple countertop, the oils will get to the food. So if somebody is allergic to nuts, avoid nut-based oils. Remove your old countertops and check that the cabinets are in good state. You may need to add extra supports for the increased weight. For example, if you are replacing laminate countertops with a thick butcher’s block wood worktop. Install your new worktops taking special care with the sink and faucet (check the manufacturer instructions). If you are not sure about this bit, you can usually get advice on your nearest DIY store. Regular care will keep maple looking good and prevent stains becoming permanent. It will also help against water damage, and can protect the wood from splinting due to damaged glue. Maple butcher blocks need to be oiled regularly, particularly when the wood is young. During the first year you should oil monthly, afterwards you can do it twice a year. To keep the color and appearance of maple wood, and to make your countertops safe for food preparation, the best choice is mineral oil as it will never decay or turn rancid. Do not use oils such as olive oil or vegetable oil or anything that you would use for cooking, as they will go rancid with time and contaminate your food. Beeswax and paraffine wear off quickly, but they can give a beautiful shiny finish to areas that aren’t used so often. Use hot, soapy water to clean the surface with a soft scrubbing pad, to make sure you remove any food particles that may be stuck. Rinse well using hot water. Spritz with a white vinegar and water solution, or a general purpose cleaning solution for wood countertops. This will get rid of any germs. Mix ¼ cup of salt and some lemon juice to a creamy consistency. Use a scrub brush and the salt paste to scrub your worktops. This will remove smells and clean stains. Rinse well afterwards and let it sit over night so it dries. A maple butcher block is a beautiful, warm and long-lasting solution for kitchen countertops, and probably the most popular kind of wood. It’s beautiful and welcoming, while at the same time being a workhorse that can deal with routine kitchen activities without being picky about tiny fingerprints, the occasional splash of juice or anything else life will throw at it. Whether you install maple butcher block countertops yourself, or hire somebody else to do it, they will be a welcome addition to your kitchen that will give you decades of good use and a good resale value.